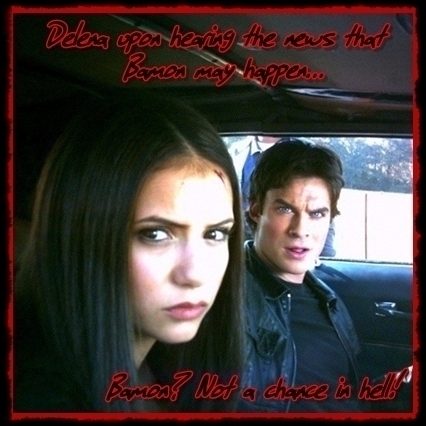 Pro-Delena Anti-Bamon. . Wallpaper and background images in the The Vampire Diaries Couples club. This is "The Vampire Diaries Couples" spot. Delena is a couple too. How is it the Stelena and Bamon spot? ^^If you wanted a group dedicated to Stelena and Bamon then it should have been called "Stelena and Bamon" not "TVD couples" so because of that, we have as much right to be here as you do. Then maybe the name of this spot should be changed to "Stelena & Bamon". As far as I am concerned if a spot name is "TVD Couples", then all couples have a right to be included here. talk to the spot creator...besides TVD Couples can be subjective, according to the spot creator those two ships are the ones worth knowing that's why she created a spot FOR THEM. Otherwise, she would've said, in the banner & motto : ' FOR ALL TVD FANS' instead it says, This spot is dedicated to fans of the Stefan/Elena & Damon/Bonnie ship!!! Sorry, but I'm just going by the name of this spot. Until it is changed, I will continue to support my ships here. Me too!!! Untill the title is changed i am not going any where!!! DELENA 4EVER!!! DELENA FTW!!! DELENA IF MY OTP!! !